Here where the usability comes into picture. The most needed one, for today’s competitive technology to reach the customers market is Usability. Usability is not only the screen of a computer or a laptop, but it is also in handling the electronic gadgets. Lot of research and innovation needs to be carried out and being conducted in this part of the testing i.e., “Usability Testing”. Salute to all those thinkers & testers who worked and being working on Usability. No doubt, Nokia has good usability where a laymen can operate very easily with any models of it within a short span of hours. The date was not 19th of the month. Few months ago tried it for 3 days i.e., on date 5th, 6th and 7th , to find why the "19" was displayed; but all what I got was more and more curiosity. The date set on the mobile phone was very correct for the day's calendar date. 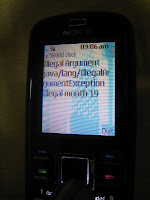 Navigation through Menu > Application > Collection > World clock, displays the Java exception “Illegal Argument java/lang/IllegalArgumentException illegal month 19”. Just think of a laymen who does not any Java stuff and wants the time of cities she/he desires when the above written exception displayed. Also, think of the person who does not know to read and write in the above situation. Auto-update of date & time was turned on with option “Confirm first”. The other two options were “On” and “Off”. On choosing the different date format, the exception was not thrown. The World Clock showed the time of the selected cities. Irrespective of the date format, the message displayed should tell the cause in laymen language. Few more bugs were seen with this model. 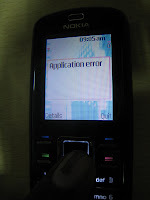 One among them was, unable to open the Message’s Inbox (the work around is to switch off and switch on the mobile). 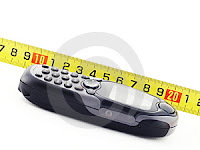 Messages were not overflown in the size/content. 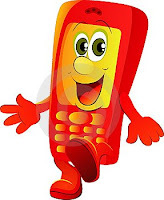 It is very happy and pleasant time for me, when I have Nokia 6080 in my hand as it is showing many new things to improve my little sand dust testing skills.